Sometimes job positions change even as we hold them. Tasks might be added or taken away as the staff grows or a company changes direction or new skills are required. The use of a Job Description Form Template can help a company keep a detailed list of all of the things done in any given position. When there is a job opening a detailed form with all of the information related to the position can be a valuable tool when it’s time to hire a new person for the job. Any candidates will also want to know what the position entails and what the responsibilities for it will be. The Job Description Form Template is available as a free download on this page. It can be customized to each position in a company and include all of the information that might be relevant to the job. Some of the information that you may wish to include is the educational background that someone needs to hold the position, the qualifications a future hire will need to be the best fit, and any skills that are needed such as computer skills or desired training. 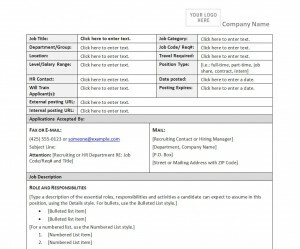 The Job Description Form Template also has a place in the upper right corner to customize the form with your company’s logo. You can also print out several copies of the job description so they are available to hand out to candidates as they come in to apply for a position. The contact information, phone numbers and fax numbers for your company can be included on the form. You can also include a salary range if desired. The template can also be a useful tool to refer to during job performance review times. The template is easy to use with spaces laid out for the information. The headings can be changed and customized as you fill in the information once you determine what you would like to include. Once you take the steps to create the Job Description Form Template you can make changes and update it in the future as needed.